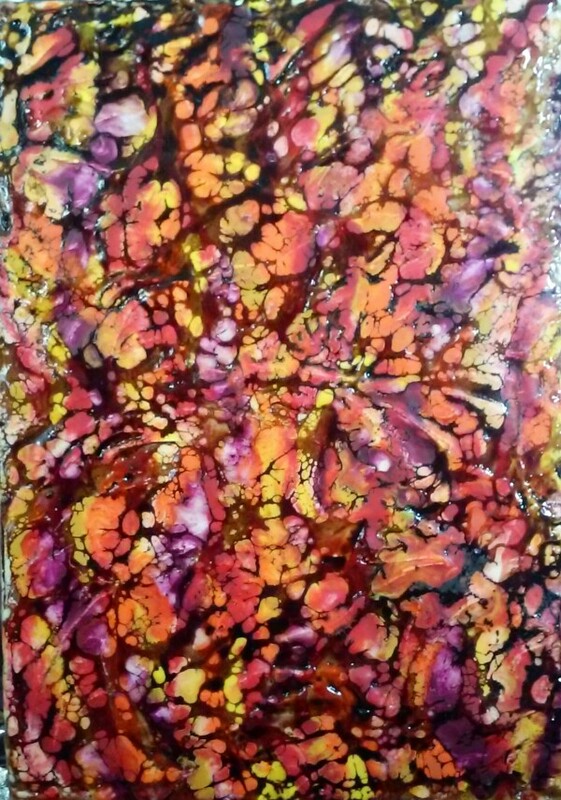 April 2016 – I Could Make Art Out Of This! 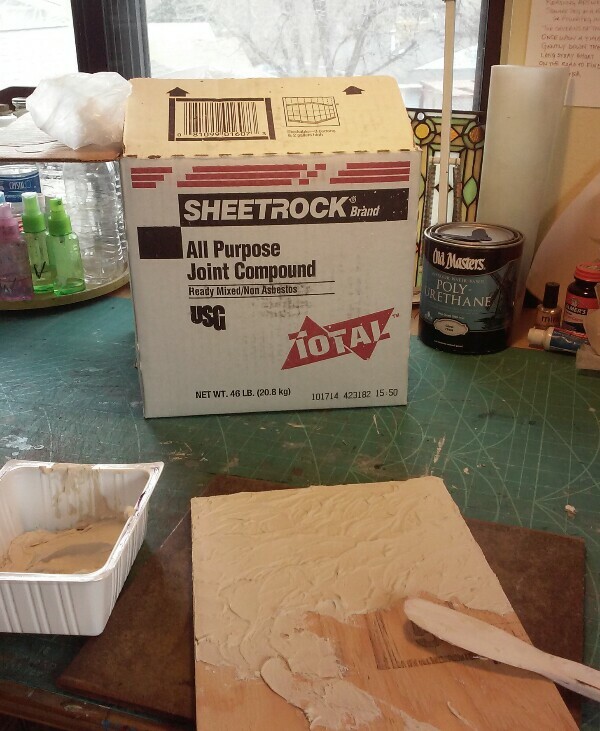 I grabbed a small piece of plywood, and a box of joint compound, and started spreading some texture on the board. 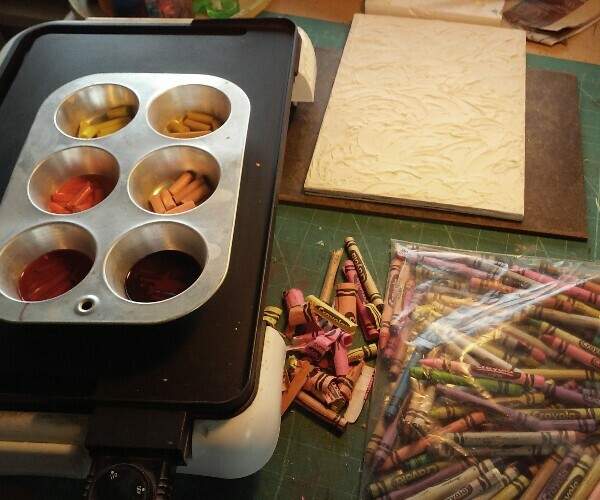 While the joint compound dried, I sorted through a big bag of crayons, (which I got for a penny apiece at Art Parts in Boulder,) and chose some colors to melt on the hot-plate I use for encaustic. Then I let the joint compound dry overnight. 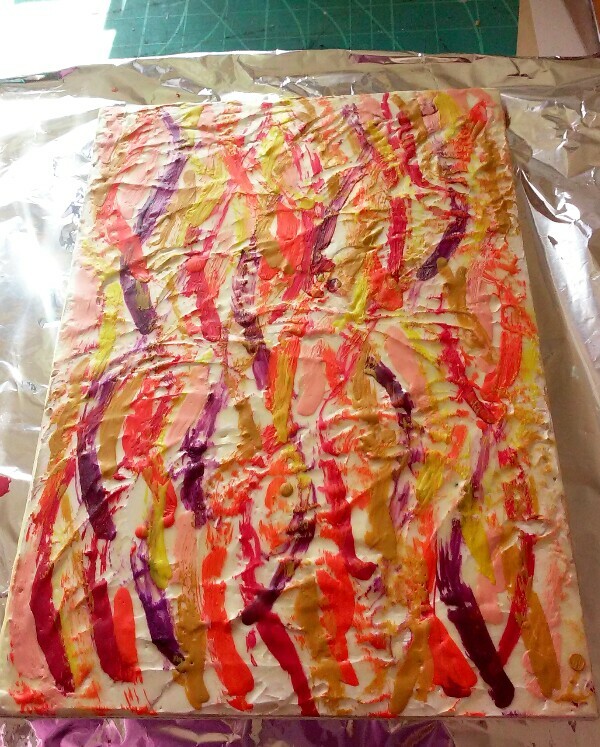 I was afraid the joint compound would be too absorbent to put the wax straight onto it, so I coated it with a light coat of clear wood stain, then when that dried, a layer of clear encaustic medium. 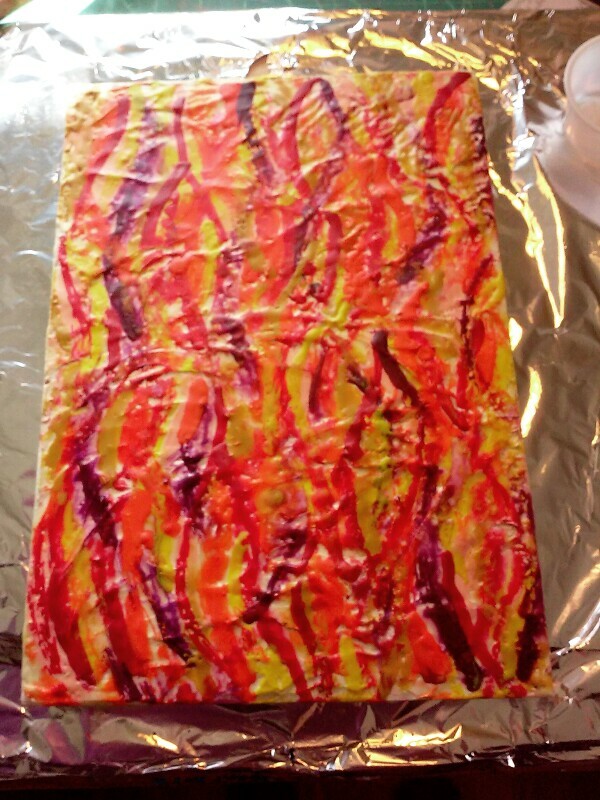 Then I went to town painting flame shapes with my melted crayons. 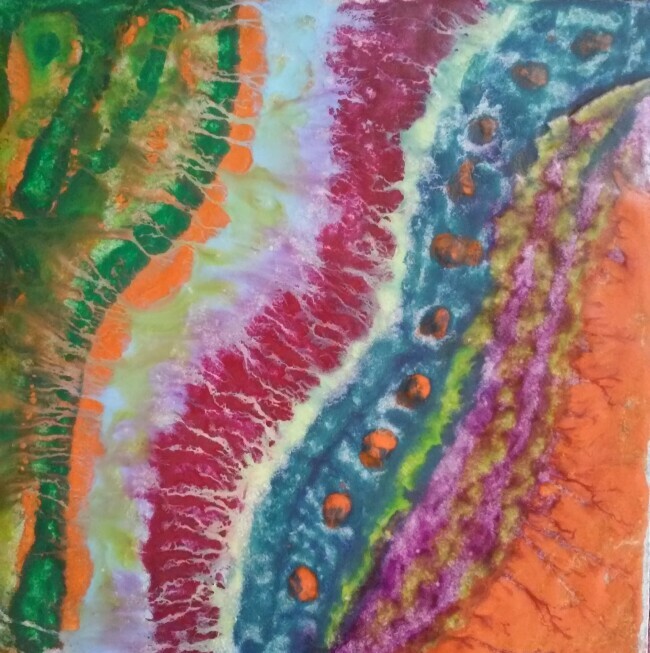 Here, I’ve fused the crayon layer with the encaustic medium below with a heat gun. Now, I’m dabbing on some color in the form of OLD stamp-pad ink; so old that the red has turned to dark brown, and the price-tag on the top says 65 cents. I’ve also mixed some of the ink into my clear shellac, and cover the whole thing with shellac, spreading out the dark brown ink, which sinks a little bit into the texture made by the plaster. 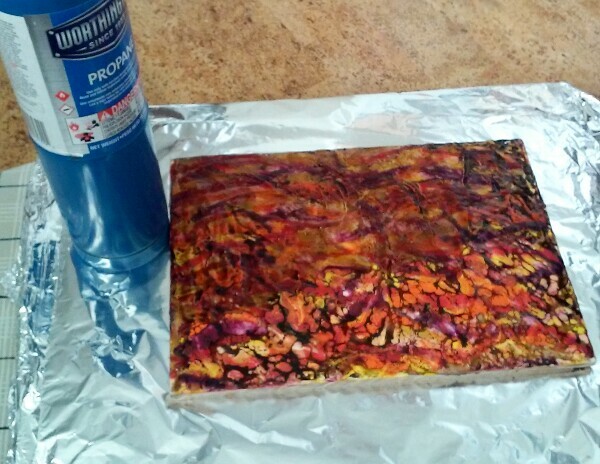 Lastly, after the coat of shellac and ink has dried for a while, I go at the surface with a propane torch. 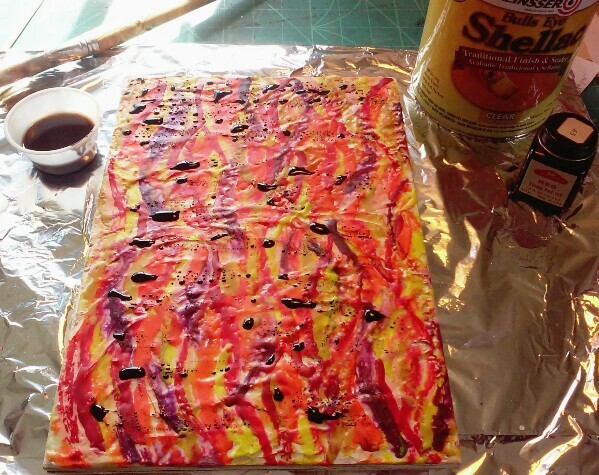 The shellac melts back to form very interesting patterns, and the wax underneath softens and moves around, too.